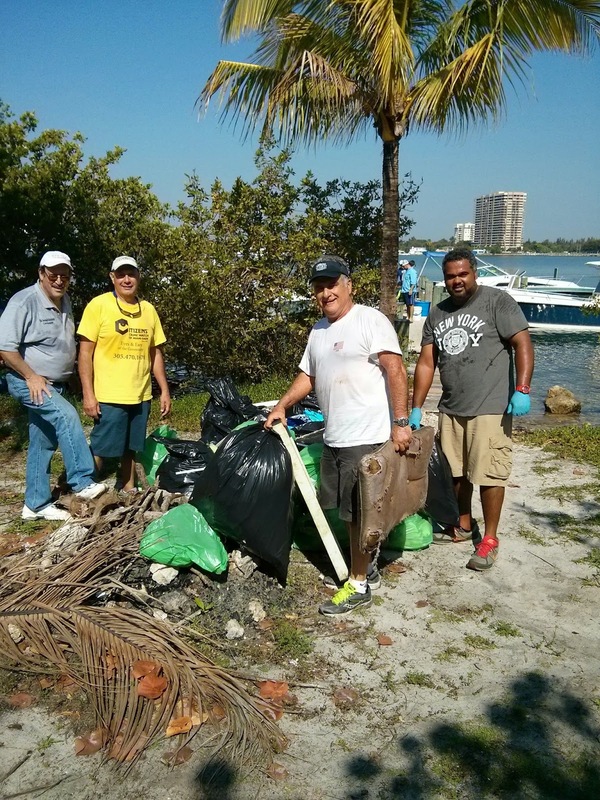 Saturday was the Baynanza, a countywide effort to clean the bay islands of the trash left behind by park users. It's a large event with people of all ages who care about the bay and the quality of life here in our increasingly fragile ecosystem. I signed up along with some buddies and a number of other North Bay Village residents. The day started out (and ended) beautifully. Mario Garcia, Jorge Brito and I met up at NBV's preferred breakfast bistro, the Hess Station, and from there walked to Pelican Island on the Causeway. The first thing that jumped out at us was that there's trash everywhere on the Causeway. Bottles, wrappers, plastic bags, and other junk discarded on the side of the road. Garcia a little obsessive and he started picking up as we walked and shamed Jorge and I into doing the same. By the time we got to the sign in station, we were already carrying several bags of trash. At the sign in station, we met up with Village Manager Frank Rollason, and Commissioners Richard Chervony and Eddie Lim. Rollason manned the North Bay Village Welcome Table while the five of us piled into a boat to go to the island of Quayside, North Miami, along with about 6 others, a mix of HS students and community volunteers. It was a hot day, getting sunnier and more humid as the day went on. We got put to work right away. We broke up into groups and scoured the island and it was amazing the trash we found. My best discovery was a pair of high heeled sandals that looked expensive (must have been a fun picnic if you leave your Manolos behind) while the kids found parts of what may have been a house - carpets, other things. 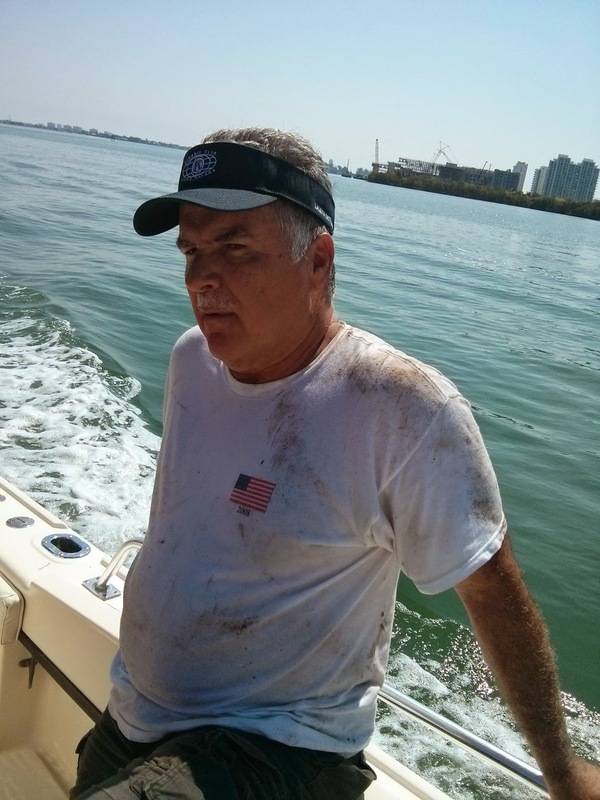 It's amazing the carelessness of people who come out in small boats and trash the place. It's the simplest thing to carry a trash bag and spend ten minutes cleaning up after yourself. Commissioners Lim and Chervony got in and picked and sorted with the best of us. All in all about 20 people in three hours got most of the trash. And it was fun. Dirty, hot and fun. Seeing the Bay in its glory, being with like minded people, getting out and moving these old bodies for a cause, good for the soul. After three hours, hot and tired and having turned the island over to a crew led by County Commissioner Audrey Edmondson, my favorite part happened. We came back on an open boat through the bay. After we landed, I thought it was over but now Brito, Garcia and Chervony were men on a mission. As we walked back on the Causeway, they were each grabbed bags and kept cleaning the trash. I was sort of peer pressured into it and resentfully joined. It's time for another cleanup. We have to clean the Causeway. Not just the vacant parts. There's trash all over the lots on Treasure Island, even occupied ones and we need to tidy our own house next. I hope we can have this event sooner rather than later. In another community note, for the first time I joined the Critical Mass Bike Ride Friday. I loved it. I know how many people were inconvenienced by it but as a bicyclist and pedestrian, my daily life is harassed by cars and buses dominating the road pushing me around and it was fun to have a street to just the 3,000 or more bicyclists. When 3,000 people take to the streets saying we want bicycle transit, the county needs to listen. I'm going to throw one thing out here. What if the county and cities actually engaged. Let's say that on certain days, Sunday for example, they closed down the left lanes of the Causeway in both directions, redid the traffic lights or stationed officers and the intersections and opened the streets to both cyclists and cars? And maybe on Friday nights as well? Bogota Colombia does it and it works beautifully. Paris does it. It's low cost, it's good for the community and it works. That's what the cyclists are saying - give us room.